We deliver webinars regularly on various topics such as Unconscious Bias, Microlearning or Soft Skills training. We also host regular product demonstrations with our Totara Partners. Join Mark Edmonds from Engage in Learning together with Meredith Henson of Totara Learning for a comprehensive guide of Totara Learn, the enterprise open source LMS, including what’s new in version 12. This highly interactive session will give you the opportunity to see a demonstration and to ask any questions that you may have. We are expecting this to be another very well-attended webinar. Another chance to join Chris Horseman, Managing Director at Engage in Learning and Alexandra Wilson, Senior Account Manager as they look at why recognising and challenging unconscious bias is vital for all Managers and Talent Development professionals. See why the Engage in Learning courses will give leaders and front line staff the skills and confidence they need to ensure bias is designed out of the workplace. Ally will demonstrate excerpts from the Engage in Learning Unconscious Bias courses – including the soon to be released Unconscious Bias course suitable for all staff. 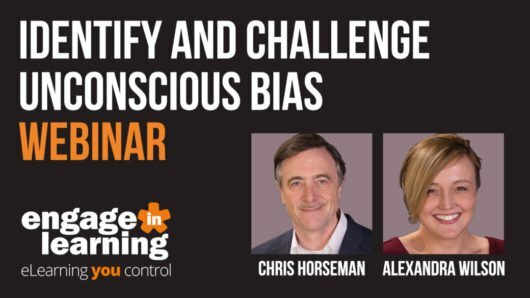 Join Chris Horseman, Managing Director at Engage in Learning and Alexandra Wilson, Senior Account Manager as they look at why recognising and challenging unconscious bias is vital for all Managers and Talent Development professionals. See why the Engage in Learning courses will give leaders and front line staff the skills and confidence they need to ensure bias is designed out of the workplace. Ally will demonstrate excerpts from the Engage in Learning Unconscious Bias courses – including the soon to be released Unconscious Bias On The Front Line. Join Chris Horseman, Managing Director at Engage in Learning and Mark Edmonds, Account Director as they look at why “soft skills” are needed in the workplace now more than ever, what a flexible management training strategy might look like and how Engage in Learning’s courses can be used as part of a total Management training solution. Mark will demonstrate excerpts from the Engage in Learning Leadership Curriculum as well as a demonstration of Unconscious Bias and Effective Email courses. Join Alexandra Wilson, Senior Account Manager at Engage in Learning and Martin Baker, CEO of Clear Lessons as they discuss the benefits of using microlearning within your organisation. See how the Bookboon eLibrary and Clear Lessons video library can add value to your Learning and Development strategy and see how both eBooks and short videos will form an integral part of your Leadership skills training. Join Mark Edmonds, Account Director at Engage in Learning, as he demonstrates how Totara Learn can be configured to totally automate your induction or onboarding process from the moment a new starter is entered on to your HR system to reports landing in a line manager’s inbox. Imagine not having to manually enrol new starters on each element of their induction programme, or sending out joining instructions or compiling spreadsheets of completion results for line managers. Our LMS expert will walk you through how Totara Learn can be configured to automate allocation, enrolment, reminders and reporting of all training, not just your induction. So, if you are considering your LMS options at the moment, join our expert Mark Edmonds to see the power of Totara Learn. You will also get a chance to see how Engage in Learning put you and the learner in control of off-the-shelf eLearning. View the Totara Learning Management System. Join Engage in Learning’s Alexandra Wilson as she discusses Health and Safety (DSE) regulations which require employers to provide Display Screen Equipment risk assessments and to ensure that controls are in place. Alexandra introduces the risks of physical and mental health complications for employees that can result in working days lost, at considerable cost to both business and the economy, and with an engaging blend of discussion and practical demonstration also demonstrates the best route to ensuring business compliance and staff awareness through cost-effective and convenient online DSE training. View the Display Screen Equipment training course or view the webinar to the right. Join Engage in Learning’s own Account Director, Mark Edmonds, as he discusses the fundamental changes to Data Protection Legislation for the introduction of the General Data Protection Regulation in May 2018, and how to maintain business compliance with staff training. Mark will be introducing delegates to the key changes that will have an effect on businesses, large or small, and why it’s critical that staff need to be aware of, and prepared for these changes. He will outline through an engaging blend of discussion and practical demonstration the best route to ensuring business compliance and raising staff awareness through cost-effective and convenient online training. View the GDPR course.